Daniel: I appreciate the time you’re taking to talk with us about your new book today. Tell us a bit about yourself. You haven’t been an author for very long, have you? Daryl: Yeah, but you know, growing up I had a lot of interest in books. I read all the time. The fantasy-fiction genre was what I mainly read. Tolkein was one of the very first fantasy trilogies that I read. It was just my kind of thing. I’ve always been interested in being a writer. Daniel: Sacrifice of the Season is your first novel? Daryl: It’s the first book that I’ve written, yes. It’s actually the first in a planned series of four. Daniel: If you had to categorize it, what genre would you say Sacrifice of the Season falls into? To me, it seems to be a bit of a mix of Slipstream and Fantasy. Daryl: Yeah, I think that’s the best fit for it. It’s a period novel set in the 1880s, but it’s a little bit Harry Potter meets Tom Sawyer. Daniel: So maybe just a little bit of Alternative History thrown in there, just for good measure. Daniel: Give us an overview of the main characters in your story, without giving too much away to our readers who haven’t had the chance to pick it up and take a look at it yet. We’ve got Jack, who is one of the main characters, and we’ve got these vague, shadowy figures, the Ba’ath. Daryl: Jack is, of course, the hero of the book. He’s about twelve years old, but he has a lot of help in, what I call a co-hero, his friend Lucius. Lucius is an old former slave who helps Jack through his difficulties in the book. Daniel: Without giving too much away, what are these creatures? We know they’ve been around since pretty much the beginning of mankind. They at times seem goblin or fey-like, and at others they appear almost demonic. Daryl: What I really tried to show, what they really are, is all of our fantasies and mythologies kind of wrapped up all in one. You know, everything starts with a seed of truth. In our mythology, in a Christian mythology, we have angels and demons. In other mythologies you have other creatures and mythical beings, and maybe they’re all one thing. Maybe there is one kind of being and all of these myths and creations from different societies and different civilizations are all based on the same beings. Really, the magical characters in my book are all of those. Daniel: Interesting. They are then an archetype of our boogey-men and gods all wrapped up into one. Daniel: Did you have any background in sociology or anthropology that you drew upon when creating this mythos? Your book really does incorporate many of these items from popular mythos into it, and makes this world that you’ve created quite engaging. Daryl: No, I don’t have an educational background in any of those subjects, but I was in the US Marines for 21 years and during my time in the Marines I traveled to a lot of different areas and was exposed to many different cultures. I have a lot of experience with the way different cultures see things, their folk tales and that sort of thing, so I put some of that into the book. Daniel: You’ve mentioned that this is a four-part series. What kind of adventures and story lines can we look forward to seeing in the upcoming books? Daryl: First, you can expect to see the story from “Sacrifice of the Season.” Where we left off we’ll pick it right back up. There’s more work for Jack to do, and you can expect Jack to do some traveling in the future. Daniel: So we’re not going to be stuck in the back woods of West Virginia for very long then. Daryl: No. Cobbs, West Virginia, the scene where all of this takes place in book one, is just a starting point. That is where Jack as a young boy is introduced to these characters. The other three books are his journey in discovering what they are, where they came from, what they want, and what he can do about it. Daniel: Moving on to a slightly different topic: a lot of our readers are aspiring authors themselves. Many of them are looking for ways to get started in writing in general, and speculative fiction including sci-fi and fantasy in particular. Do you have any advice for budding writers, for someone who is seeking to just jump right in and write their first novel? Daryl: Yeah. I guess my advice would be: Don’t do that. Daniel: Don’t follow your example then. Daryl: No, don’t do that. The reason I say that is, you know, the thing that I had in my corner was that I had appeared on the show Top Shot, which is very popular and all of a sudden there were three million people who knew my name. I had the forum to be able to do that. I could throw it out there and see what happened. Luckily the quality of my writing has passed the litmus test of the public, and people like the book. What I would say to a new writer, or someone who wants to get into it, is don’t rush into it. Really really make sure that your writing is good writing, because there is so much bad writing out there, and there is so much marginal writing, that the publishers, the traditional publishing model, are very skeptical of new writers. You really have to make your work quality stuff. Daniel: What’s a good way that authors can do that? Daryl: Well, what makes quality is often subjective. There are a couple of things you can do. For one, get your work professionally edited. I’m pretty good with grammar and punctuation and all that, but you still need a person who does it for a living to professionally edit your work. Second, get your material, not all of it but pieces of it, into as many hands as you can. Join some book clubs. What they do is they meet once a month or so and they exchange pieces of work. Daniel: Did you join any writing or critiquing circles? Daryl: Yes, I did. I actually belong to a couple of them in the Dallas area, and you know it wasn’t so much, “Hey, help me with my writing.” I go there to get feedback on my work. The other side of that is that you’ve got to give other people feedback on their work. It’s a bit of a learning process too. You write something, and then you get someone else’s work and read it too and go, “Wow, this writing is really good. They’ve got a certain way with words,” or, “I really like that phrase they used,” and so you can kind of judge where you are in the pack of writers. Daniel: At The Colored Lens, we focus on the short story. In some ways, the short story is considered more difficult because you have to take and distill the story down to less than 10,000 words, for example, while still having full characters and a well developed plot. At the same time, we’ve found that it can be easier for new authors to take the smaller bite that is the short story, rather than tackling an entire 150,000 word novel all at once. Daryl: The benefit, in my mind, to a shorter story, is that you can focus all of your attention on that one project for a short period of time. You can turn out a really high quality piece of work, and you can do that a number of times. If you write enough of those quality short stories, people are going to notice. The other thing about writing a full length novel is writer’s block. It actually happens, and when you are halfway through your novel and all of the sudden you’ve reached a point where you’re not sure how to go further, it causes problems. Shorter stories eliminate much of that. I also want to add one thing about self-publishing. There are a lot of authors, established authors, who are now taking the self-publishing route because the traditional publishing model, unless your book is just a runaway success, is not a great way to make a living. It’s just so hard to get your foot in the door with the publishers. You have to have an agent and that sort of thing. It’s just really hard. Before you go the self-publishing route, you have to be prepared to do a lot of promotion by yourself. You have to be ready and able to go around to book signings, and without that level of promotion, you are giving yourself the kiss of death. After you self-publish, the publishers will not touch your work. There are few exceptions, but once you self-publish it’s all on you to make that piece of work a success. Daniel: Well we wish you all the success because you’ve got a fine novel and I can’t wait to see what happens in the upcoming three sequels. 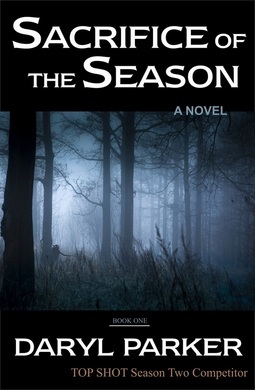 For any of our readers who would like to get their own copy of Sacrifice of the Season, it’s available in paperback and Kindle format from Amazon.com, or you can get your own signed copy of course from Daryl’s website DarylParker.com. Daryl: Thank you very much. I’m working on book two right now, Journey of Fear, and I hope to have that one finished by the end of February, so look for the release probably in June. Daniel: Great, we’ll definitely be looking forward to that book. Thanks again for talking with us. Daryl: It’s been a pleasure. Read Daryl Parker’s newest short story The Death Of More, a companion piece to Sacrifice of the Season, which is available in the Winter 2012 issue of The Colored Lens.